Born in Essex in 1944, Graham Petley was educated at the Headley Walter School in Brentwood before attending the South East Technical College in Design. After working for a time as a window dresser and deep-sea fisherman, he opened an art gallery in Rayleigh in 1972 where he worked hard to promote several artists as well as his own work. In 1980, however, he decided to sell his business in order to concentrate on his paintings and since then he has exhibited widely across the country. Inspired by the changing seasons, Graham captures the mood and poetry of the countryside. All the pastoral pleasures of the country's magical seasons are faithfully recorded and portrayed in his paintings. 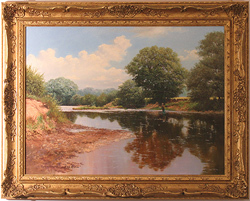 Rising early to catch the pearly light of dawn or lingering to witness the golden hues of dusk, Graham has captured the timeless charm of the countryside with breathtaking clarity. Graham Petley is one of Britain's foremost living landscape artists. A dedicated and life-long painter who has worked alongside the descendants of the great Impressionists and a former member of the Fine Art Trade Guild, London. Graham has been commissioned on several occasions by members of Middle Eastern Royal families and is regularly exhibited at London's leading galleries. His paintings are now collected throughout the world. Please note that all Graham Petley art listed in this section has previously been displayed for sale and is not currently available.